The sand cherry, Prunus x cistena, is a medium-sized shrub that reaches a height and width of 8 feet. The shrub forms fragrant flowers in spring that turn into dark-colored fruit in mid-summer. Proper maintenance and shrub management through out the year prevents the introduction or occurrence of diseases that damage the fruit and shrub structure. The sand cherry is susceptible to the fungal diseases plum pockets, powdery mildew and trunk canker. Plum pocket infects the shrub in spring when the Taphrina fungus spores attach to mature branches and leaves of the sand cherry. Powdery mildew is a disease caused by the Podosphaera oxyacanthae fungus and infects the shrub during the spring season. Trunk canker forms on a shrub from the presence of a fungus or a bacteria pathogen entering the shrub. Plum pocket is a fungal infection that creates distorted fruit with pocket-like growths and deformed shrub shoots. Powdery mildew is a fungus that presents itself as a white powder over the shrub foliage, curled leaves and the eventual presence of black dots on the leaves. Trunk canker is a fungal, sometime bacterial, infection that penetrates the shrub trunk, causing a large canker growth that chokes off the shrub. The plum pocket disease occurs when fungal spores become active in late spring. The spores attach to the buds in spring and stay in the dormant stage for the remainder of the growing season. Plum pocket disease systems occur the following spring season when the buds open. Powdery mildew and canker infections occur when the fungus forms and spreads in humid, wet weather since heat and moisture create an environment that is optimal for fungus growth. Powdery mildew spreads throughout the shrub and to neighboring plants and trees from rainwater splashing the spores. Canker infections enter the shrub through a mechanical or natural wound made on the shrub trunk. 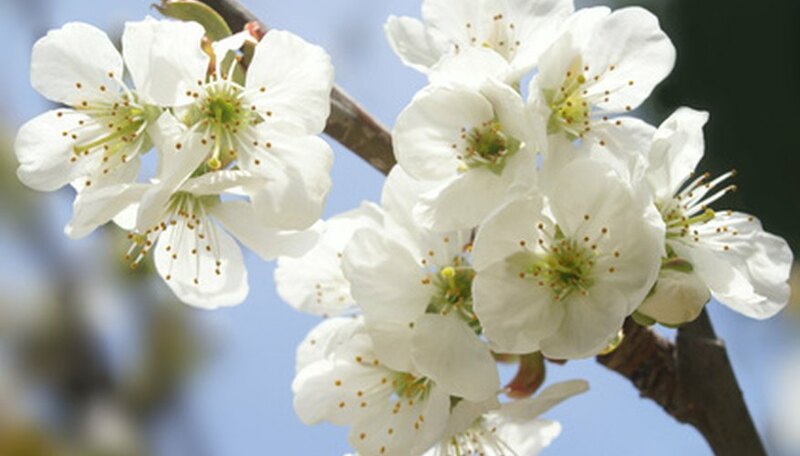 There is no management or treatment for a plum pocket infection since the infection is present in the shrub for one year prior to symptoms appearing. Remove and destroy the shrub to prevent spreading to other shrubs. Treat a powdery mildew infection with an application of a benomyl fungicide found at garden supply stores. Verify the application rate and frequency listed on the container. Severe trunk canker infections where the shrub is choking off and dying require removal and destruction of the shrub. Remove branches infected with cankers, making sure to disinfect the pruning equipment before, during and after the pruning session to prevent spreading the pathogen. Yearly shrub maintenance to prevent a plum pocket infection includes spraying the shrub with lime sulfur during the late winter dormant season and again after leaf drop. Prevent powdery mildew infections by removing all branch and leaf debris underneath the shrub in the fall season. Prune the shrub to open the canopy for air circulation so the leaves and branches dry quickly. Prevent a canker infection by pruning during the dormant season and disinfecting the tools before pruning and after making each cut.